KENNEDY SPACE CENTER, Florida - Alligators will eat sharks if given the opportunity and vice-versa, according to a recently released study. James Nifong, a postdoctoral researcher at Kansas State University, and Russell Lowers, a wildlife biologist with Integrated Mission Support Services at Kennedy Space Center, Florida, published a study documenting that American alligators on the Atlantic and Gulf coasts are eating small sharks and stingrays. This is the first scientific documentation of a widespread interaction between the two predators. "In the article, we documented alligators consuming three new species of sharks and one species of stingray," Nifong said. "Before this, there have only been a few observations from an island off the Georgia coast, but the new findings document the occurrence of these interactions from the Atlantic coast of Georgia around the Florida peninsula to the Gulf Coast and Florida panhandle." Despite the freshwater and saltwater differences, Nifong said it is fairly common for sharks and rays to share the water with alligators. 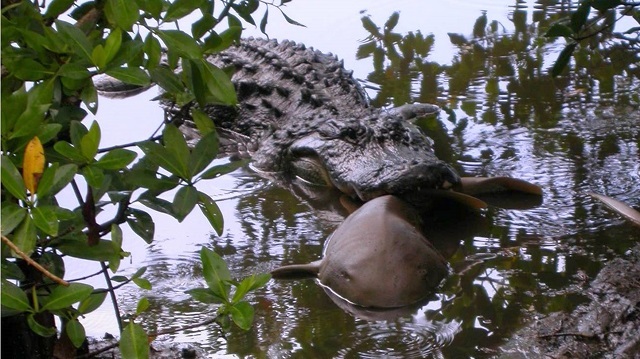 Many sharks and rays can swim into freshwater where opportunistic alligators can't pass up a good meal. Although alligators don't have salt glands like true crocodiles, they are resourceful as they travel between freshwater and marine habitats. "Alligators seek out fresh water in high-salinity environments," Nifong said. "When it rains really hard, they can actually sip fresh water off the surface of the salt water. That can prolong the time they can stay in a saltwater environment." Alligators are opportunistic predators with an indiscriminate appetite that includes fish, birds, reptiles, amphibians, mammals, and even fruit. Because of their predatory nature, alligators may target people, pets and livestock as food. Nifong said sharks can also end up on the menu. "The frequency of one predator eating the other is really about size dynamic," Nifong said "If a small shark swims by an alligator and the alligator feels like it can take the shark down, it will, but we also reviewed some old stories about larger sharks eating smaller alligators." Nifong dug into history and found news reports from the late 1800's that described battles of large masses of sharks and alligators after flooding and high tides washed the predators together near Jupiter, Florida. One particular historical incident included in the journal article described how the sharks were attracted to blood from alligators feeding on fish. When the alligators were washed out to sea, the sharks attacked.